A mixed case of organic white and rosé wines. Includes two blushing pink rosés: dry, fresh Finca Fabian Garnacha Rosado and classically sweet Mas de Longchamp Rosé. 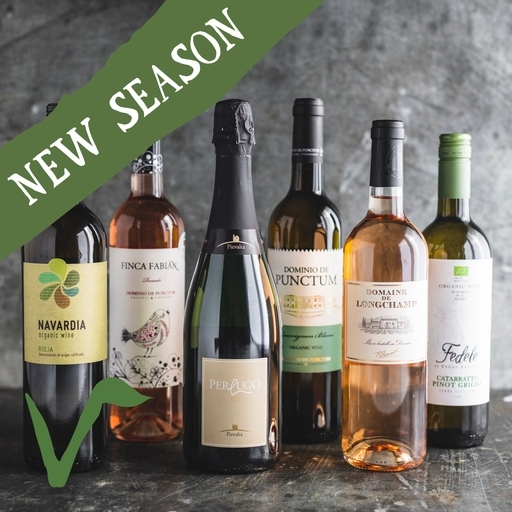 You’ll also get four easy-drinking white wines: Dominio de punctum sauvignon, crowd-pleasing Fedele Catarratto Pinot Grigio, the refreshing Navardia rioja blanco and Barone Pizzini’s fragrant Italian fizz Spumante. Mas de longchamp rosé 75cl: 80% Grenache, 20% Caladoc, Alcohol 12.5%, sulphites 102mg/l, produced in France, Suitable for vegans. Perlugo spumante extra brut 75cl: 100% Verdicchio, Alcohol 12%, sulphites 50mg/l, produced in Italy, Suitable for vegans. Fedele catarratto pinot grigio 75cl: 60% Catarratto & 40% Pinot Grigio, Alcohol 13%, sulphites 92mg/l, produced in Italy, Suitable for vegans. Finca fabian garnacha rosado 75cl: 100% Garnacha, Alcohol 13%, sulphites 80mg/l, produced in Spain, Suitable for vegans. Navardia rioja blanco 75cl: Sauvignon Blanc & White Grenache, Alcohol 13%, sulphites 85mg/l, produced in Spain, Suitable for vegans.